When I taught kindergarten, I loved to read the series of books by Jane Belk Moncure called “My ___ book”. She wrote a book for each letter of the alphabet. These books were the perfect introduction to whatever letter we were focusing on at the time. After reading the book, we made a word bank and then played the “boy-girl game”. I wrote up instructions for how I used this book and made a few printables to share with you. The instructions are easy to follow and would be easy sub plans the next time you need to be absent from school. There are 3 different worksheets to choose from. Two of them look alike except for the font. Some teachers prefer font that looks like printed handwriting, while others like a more artsy look so I made one of each. 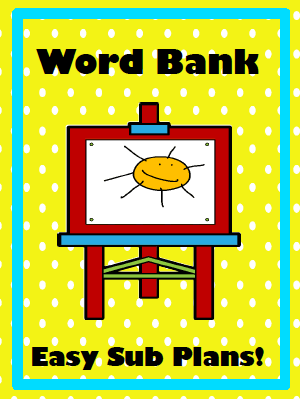 There is also a worksheet that has the students write a sentence. These can be used to differentiate the assignment. I am joining Sally @ Elementary Matters linky party. I have all these books and love the worksheets you made. Thanks so much for sharing! Officially became your latest follower using Google friend (even though I have been following you using Reader). I love the sheets that you made to go with these books. Thanks so much for sharing. BTW I am following you now too. You are welcome! I'm glad you like them. Great stuff! Thanks for linking up!